DENIM. 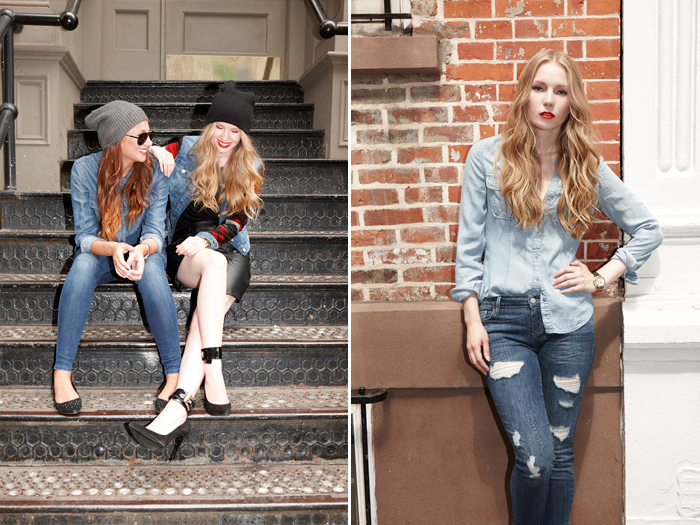 Here are the final pictures from the Denim Diaries campaign I shot with Guess last month! For details on what I’m wearing + a chance to win some of the looks, head over to Guess.com/DenimDiaries. Fabulous photos!!! So cool! I love Guess jeans! Love Guess, the red jacket is amazing! Amazing photos Carol!! Love them all!! Loving so much your style ! Awww I love every single look! Love these photos and these outfits are so pretty. I just loooooove your blog! I love your take on Canadian Texudo! Denim on denim looks good! Love the all denim look and the leather cap! So cool photos I love their sharpness and light so amazing! Also 2nd look is perfect so chic! Love your makeup in these shots! Such a great bold red lip. And fabulous styling! love this casual cool look! Don’t forget to enter my giveaway for a custom monogram necklace! I am not a big fan of guess, but when I see these looks, i am second guessing! Gorgeous photos! Guess are amazing! I love the looks, you’re so beautiful, you look like a porcelain doll Carolina! Gorgeous photos, you look stunning! The red leopard blazer is AWESOME ;))) Great job dear! You look fantastic! Love the red jacket! The first shot is my favorite! You look stunning.You have such a pretty skin! Great pics! Loving the black and white ensemble!! All of them are gorgeous though! you look so cool with the red jacket! That plain red jacket looks SO good on you. The hue is perfect to compliment you complexion and even your style. You look really great and perfect hair. Love the photos & the looks! too hot today!!!!! people around is dressed with summer clothes!!!! I write you because you like me a lot, i think you’re very beautiful, i love your hair and you looksa very nice girl but why don’t you wear summer clothes in august???? you have face and body for that!!!!!!!! by the way, how do you take care your hair????? it´s spectacular!!!! wow! lovely hair and heels! Reyes: Haha no, no you misunderstood, these pictures are for a FALL denim campaign for Guess, we shot these pictures over a month ago and they are meant as inspiration for fall! If I wore this today I would have died, haha. the photos and the video are great. I love the leather cap and the denim on denim in these photos. amazing pictures and video clip, the perfect four ladies to represent the brand! I love the styling of this shoot! I used to work at Guess, and to this day it is still my favorite job. That brand has such a fashionable yet relaxed vibe. Perfect looks! Guess win with you! Gorgeous clothes, I love the little pops of red. I love the contrast between the red wild jacket and denim!! it is so sool. Red lips are very sensual. You look stunning in these photos! Love your curls, beautiful outfits too! you’re phantastic in these photos!!!!!!!! The jackets and the cap are so amaizing!!! i want that leather cap right now! Guess denim is the best for me! It fits perfectly! Lovely looks! Congrats on this project, you totally deserve it! love looks and love style! Thanks to share the lookbook with us ! I love this collection, smart and casual ! I absolutely LOVE your blog! I found out about you through Teen Vogue’s mention of you being part of the Guess Denim campaign! You are stunning and your concepts are really refreshing! Great post!! I love all the pictures and the video!! You look great in all the looks and very natural, also the collection of Guest for next season is great!! I enjoyed watching all the beautifull spots were you took these pictures! !I´ve recently moved to NY to study fashion at Parsons and I like to see cool places in the city. Love this- it’s super cool! Denim brand is always good. All products are very suitable. Soooo stunning, stylish, and perfect! loveeeeee your looks! Great looks. I love the double denim and the leather jacket. GUESS is such an amazing company! the red jacket in the first picture! absolutely adorable!